Starting tomorrow and for the next two weeks afterwards, there will be a new post every weekday as you, the SuperFans, take us through each and every chapter of the Valhalla saga so far. Each recap will be done by a different artist and, in most cases, in a completely different way from what Marc and I did. 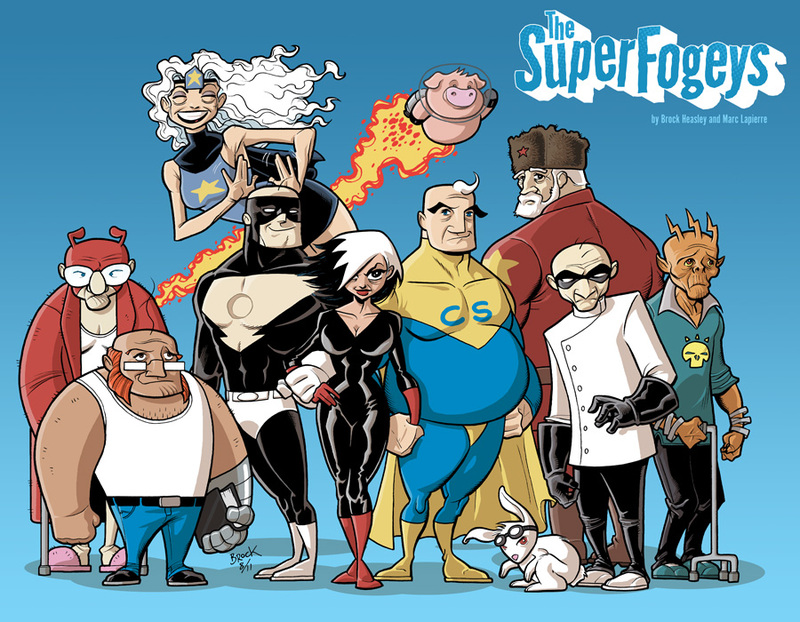 Also, be sure and check out the blog under the strips–I’ll be running lots of fan-created pieces. Hopefully a new one every day. If you’d still like to participate (and potentially win fabulous prizes), feel to send me a short essay or fan art having to do with SF during the entire run of the celebration. I won’t select a winner until it’s all over. Congrats, Brock! I’ve loved every moment. This is an amazing series. Cannot wait to see what mayhem you unleash in the next 5 years. Brock, you did an amazing job on continually developing your characters and your artistic abilities. Happy 5th Anniversary man, what a road it’s been. I’ve been reading SF for almost 4 years now and have had a chance early on to go back to the beginning and be there as each new page came up and to watch as Marc took over recently doing the art work. This has been an amazing journey for me as a reader. I’ve grown to love and care for each of the characters, even those that we find at times hating due to their actions. Each of your characters bring a special uniqueness to them, and the Origin stories have allowed us to emotionally attach ourselves to them. I’m glad to have found your webcomic all those years ago and look forward to what lies ahead down the road for the next 5 years. Congratulations! It’s always great to see how comics progress over the years, and this one has done marvelously. Wow – how far and how well has this road been travelled…. Oh, good. The party’s starting. 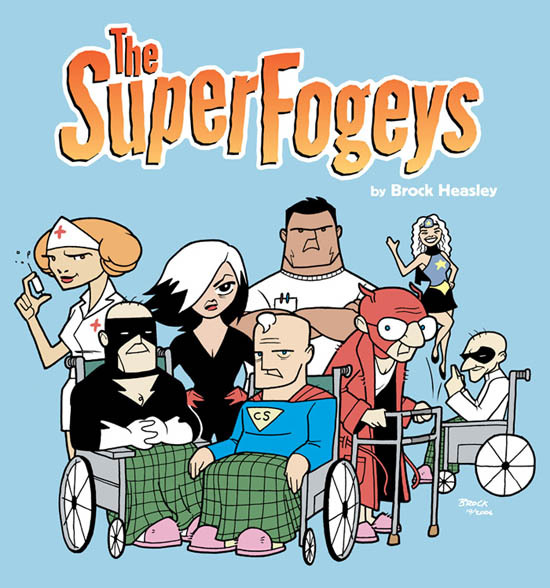 Congratulations Brock, your comic has come a long way and I love your art. I hope you continue to draw for fun because you are very talented. Amazing to see the development of the characters from the first group shot. I’ve always loved & admired SF, ‘lets see another 5, yes? Congrats, cubicle-ant-mate. Wowee. That is awesome. Congrats on reaching the five year mark! It’s amazing where life takes you, even in terms of artistic detail, such as the above. What’s neat is that the character development matured right along with the art, making each chapter more exciting in more ways than one. SWEEET! Art’s looking good, Brock! Especially love seeing that first group shot! Never saw it before. It’d look great with Cap’s more original costume too! Awesome, man. As always, I love seeing the progress. Congrats on 5 years. Huge accomplishment with a great comic. Hey, kids! 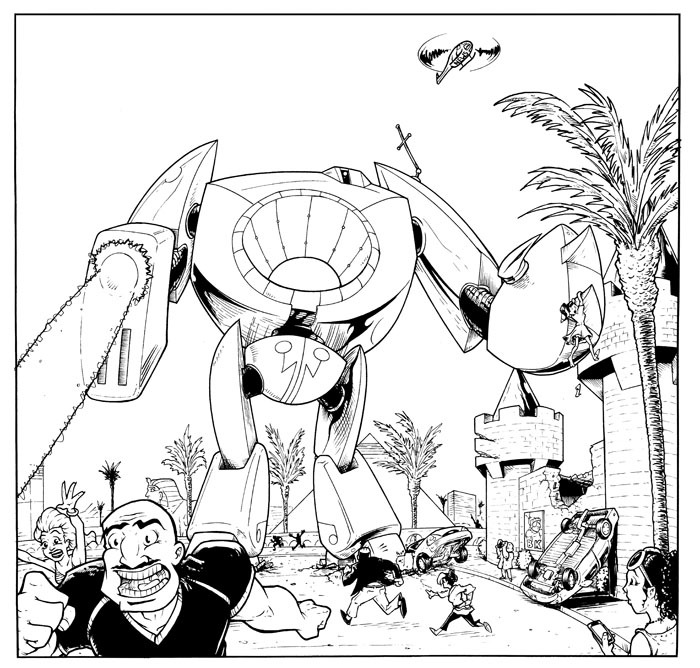 It’s your friendly neighborhood SuperFogeys artist here with a look at how the art for this massive robot reveal developed. 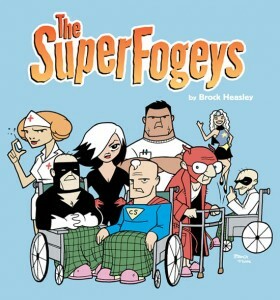 It all started shortly after I agreed to take on the Fogeys as regular artist. 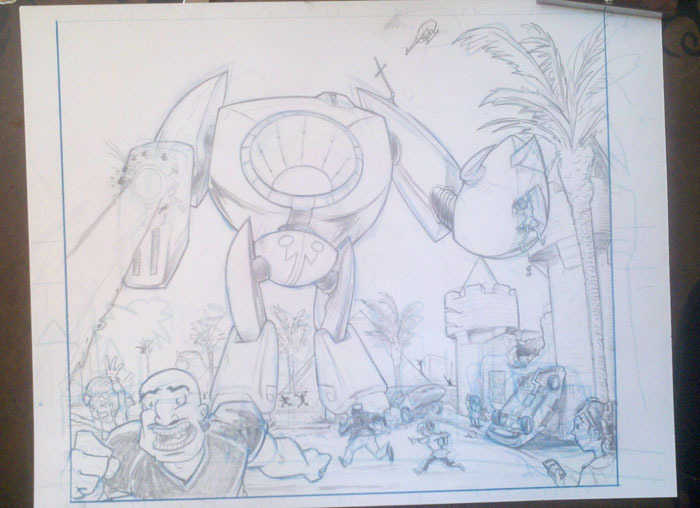 Brock told me that Jerry’s plans called for a giant robot to attack Las Vegas and it was up to me to design it. 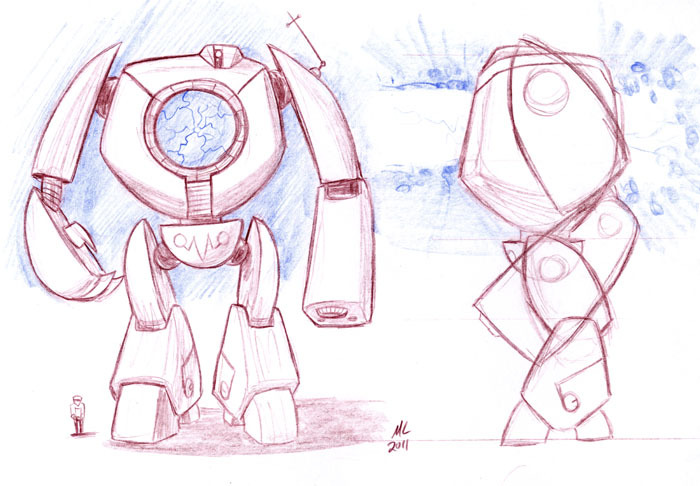 The only stipulation to Brock’s request was that the robot design be different than what has been seen before. After a few quick sketches to experiment with the form the robot would take, I quickly hit upon a shape I liked. 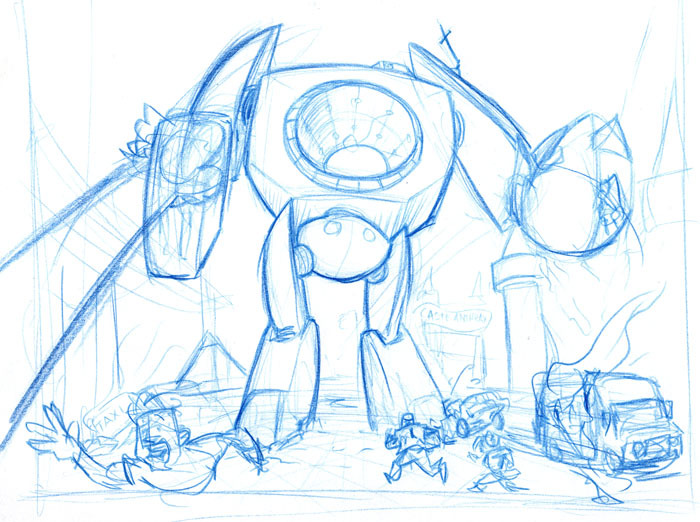 I then fleshed out the form to this sketch complete with a tiny Doctor Rocket to show it’s scale. The first two things I decided about the design were that the robot would be asymmetrical and have a giant hole in the middle. Everything else grew out of those choices. I justified the giant hole by envisioning it as a giant energy lens of sorts. It collects any ambient energy in the area then amplifies and focuses it into a giant, devastating blast. The antena on the shoulder was originally drawn there as a way to further break up some of the symmetry. I really had no other purpose in mind for it at the time other than looking cool. Some time after designing the robot, Brock informed me he had decided to make the robot transform into the jet the SuperFogeys would use to get to Vegas. This presented a new challenge. How do I make this robot turn into a jet without going back to square one? I thought about designing a new futuristic jet that would incorporate some of the robot’s design structure. That option seemed like a lot of design work an also held the potential to tip our hand too early that the jet and the robot were one and the same. My ultimate solution was to have the transformation take place via nanorobots that could rearrange the molecular structure of the robot. The previously functionless antena was then re-imagined as the delivery device for the nanorobots. Hence the antena being part of the jet’s design also. Colors and effects were added in Photoshop and now the scene is set for some full on giant robot action on the Las Vegas strip!